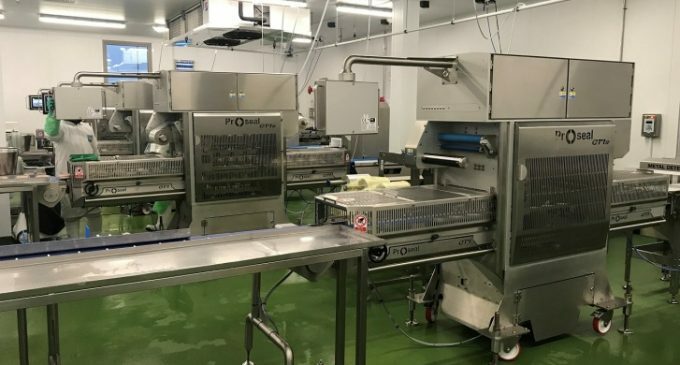 The high speed and low maintenance of three Proseal GT1s tray sealers are providing Heck Foods with increased efficiency in its factory operations as well as better quality packaging for its sausage and burger products. The tray sealers deliver a fast and reliable sealing operation, running for 12 hours a day and at a speed of around 60 packs per minute. The top sealed trays have replaced Heck Foods’ previous shrink-wrapped packaging, ensuring the company’s products are now better protected, more effectively presented, and more convenient for both retailers and customers. Top sealed trays offer a stronger pack format than shrink wrap, providing additional protection by being fully, hermetically sealed and ensuring the products are displayed to their best advantage by using a stretch film that also allows vertical display. The GT1s machines are installed on three lines in the Heck Foods factory, with two machines packing sausages and one packing burgers. Proseal’s ProMotion system maximises throughput with its following motion and intelligent buffering technology that enables trays to feed continuously into the sealer without stopping. The machine’s I-Film technology meanwhile ensures effective monitoring of the film diameter for high-speed printing. Particularly important for food markets such as sausages and burgers, Proseal’s unique Eseal® technology provides high quality seal reliability. At the same time, it delivers a 92% reduction in energy usage, which offers valuable cost savings and sustainability benefits. Heck’s operations are further enhanced by Proseal’s ‘Auto Tool’ connection system, which enables tool changes to be carried out in around two minutes. Quick-change conveyor belts and an auto-lock film reel holder also reduce downtime. Based in Kirklington in North Yorkshire, Heck Foods is run by the Keebles family and has now passed down to the family’s second generation. The independent company prides itself on delivering farmers’ market quality sausages to a wider market.